Honda 7000 – $160: Great for powering large lights without renting a tow generator. Capable of powering an Arri M40 and an M18 simultaneously. Honda 6500 – $160: Similar to the 7000 this generator can power large lights without the need for a tow generator, great for quick nighttime exteriors. 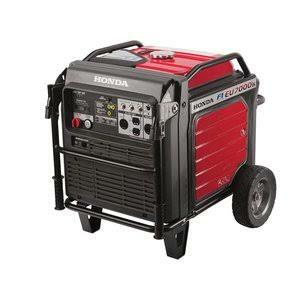 Honda 3000 – $70: This mid size generator is great for powering your trucks lift gate or even a DIT truck or Camera Truck. Allowing you to keep your production running without a need for house power. Our Honda 3000 comes with a rolling cart for easy transportation. 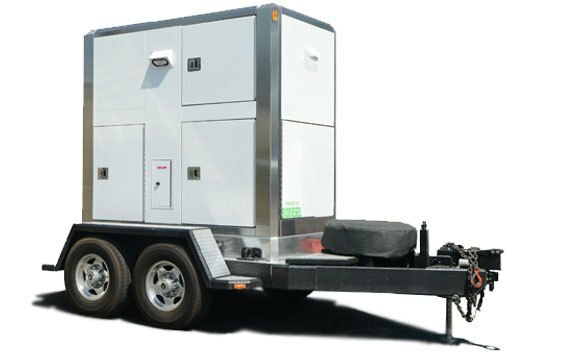 Honda 2000 – $55: Similar to the 3000 this generator can keep truck lift gates and smaller camera and DIT trucks running. Honda 1000 (Putt – Putt) – $40: This generator is small, convenient and quiet. Great for camera carts for charging batteries, mobile devices, and any other small instruments that need power. The technically-advanced, yet operator-friendly, SG1600C3 studio generator is designed specifically for the entertainment industry to reduce noise and increase reliability. The unit features a microprocessor-based digital controller providing a color graphic display and remote monitoring capability for a truly state-of-the-art control package. The updated controller can also remotely monitor and operate the generator through a simple wireless internet connection. A variable-speed hydraulic fan drive is used to allow the fan to spin slowly under smaller loads providing more efficient airflow while reducing noise. The Cummins™ engine is equipped with an isochronous electronic governor providing precise frequency control of ± 0.25 percent, as well as an all-aluminum housing to eliminate excess weight. The technically-advanced, yet operator-friendly, SG 1400C3 studio generator is designed specifically for the entertainment industry to reduce noise and increase reliability. The unit features a microprocessor-based digital controller providing a color graphic display and remote monitoring capability for a truly state-of-the-art control package. The updated controller can also remotely monitor and operate the generator through a simple wireless internet connection. A variable-speed hydraulic fan drive is used to allow the fan to spin slowly under smaller loads providing more efficient airflow while reducing noise. The Cummins™ engine is equipped with an isochronous electronic governor providing precise frequency control of ± 0.25 percent, as well as an all-aluminum housing to eliminate excess weight.